Amy just always knew her job would be in fashion... call it glamour. "It started around 4 years old. My mom has this picture of me all dressed up in high heels. Though my style now may be deemed classic and sophisticated and I never won the most fashionable girl award in school, I knew I loved clothes. I loved looking at people that were styled. I loved seeing how people coordinated outfits," Amy Weaver-Kaulis divulges to me, talking with her hands, her giggly voice echoing through the Starbucks on State Street. "I just always knew my job would be in fashion. There was always something that drew me to it. Let's call it glamour," adds the chair of the Fashion Merchandising program at Mercyhurst University. Glamour. Magic. Excitement. It really is what calls many of us to a life in fashion. "But let's face it, at the end of the day when you take all that glitz away, it is a business set to turn a profit. The goal is to make money," she says, spoken like a true professor laying out the reality of the industry. For those that are fashion hungry but excel in styling or design, there's a place for you. For business-minded professionals that want to capitalize on fashion, there exists strong profitability in this trade. Fashion is also there for those that wish to teach. Like Amy, who earned her Bachelor of Science from Mercyhurst. "I knew I would teach," she leaned in as she shared this, like it was some kind of secret, a glimmer in her coffee-brown eyes. "When I was a sophomore here, I wrote in my goal statement that I planned on going to graduate school in hopes of one day returning to Mercyhurst to pass on my knowledge and grow the program. I have that statement framed in my office." Spoken as assuredly as the goal she set for herself, she would become the soothsayer of what's in vogue and dish the goods on how to tread water while surrounded by sharks – very, very stylish sharks. From 2000 to 2013 the enrolling freshman class has more than doubled (37 in 2000 to 77 in 2013). This boundless interest is not stopping – it's gaining momentum like an insatiable trend. With bloggers, Instagrammers, and online stores like ModCloth and Nasty Gal, chic faddism is at the forefront of Wall Street. Uber-stylist and reality star Rachel Zoe would have never successfully gained the following she has now if not for Bravo and the Internet. Now, as social media spills over, tipping the pot, a career in fashion is more obtainable than ever. Even though many fashion elites are self-made, a college degree is still the best weapon. "It's the students that have made this program what it is today," Amy gushes about her pupils. She's very modest. She began her career at Mercyhurst in 2002 as an adjunct faculty member, teaching Introduction to the Fashion Industry. "I really fell hard for this. It's that monumental moment when you know you are doing something right. I wanted to do this for the rest of my life," she tells me of the stars aligning in her favor. She continued her graduate degree online from the University of North Texas, where she earned her Master of Science in Industrial Technical Merchandising and Fabric Analysis and a minor area of study in Higher Education. All of this while teaching and working part-time at Talbot's. Amy's dedication is unsurpassable. But that's what we do to reach our goal; we either choose to settle or soar. 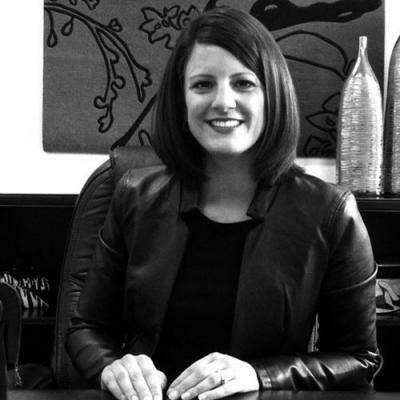 In 2004, Amy continued as a part-time instructor, was hired full-time in 2006, and was promoted to Chairperson of the Fashion Merchandising department in 2012 after the former chair Marilyn Smith retired. "Our curriculum in the department allows someone, regardless of where their interests lie, to channel which career path would be the best for them in the end," she explains. "Our graduates are a huge part of our growing department, as I mentioned before. These students are going off and getting awesome jobs. The freshmen see this and know that promise awaits them as well. It's very motivating to them." And exciting developments are on the horizon under Amy's guidance, as other schools are starting to come to the department with stupendous offers. Of the two new happenings, one is a study abroad opportunity. For the first time, students are able to take advantage of traveling to Europe for credit. This past summer, two eager students accepted the challenge and attended the American International University in Florence, Italy, earning three college credits while gaining an enviable experience. The other new opportunity on the lineup is additional learning through Kent State. Mercyhurst always had the visiting students program with the Fashion Institute of Technology (FIT) in New York City but now this new development gives even more options to budding talents thanks to the school's director Kim Young who approached Amy about the partnership. "FIT and Mercyhurst have worked together for years offering the students an associate's degree where the pupils spend a year at FIT. Now we also offer a semester of study with NYC Studio," she informs of the new alliance. "NYC Studio is great because the students get the big city feel while only committing to half a school year. At the Studio, they are instructed to take a class that is sort of an infiltration into the industry – they visit a different facet of the fashion world to learn more intimately the atelier, local design shops, trend forecasters, and public relations." There are also a few new classes being offered to the students. "As fashion changes and multiplies in popularity, our curriculum needs to adapt," Amy shares. "We will begin teaching these classes in the 2013-2014 school year: Fashion Journalism – touching on article writing, blogging, and news casting – like the E! Network," she giggles, tossing back her string of pearls. "All incoming freshmen will be required to take Public Speaking for Fashion – we want to set them up for success in classes to come where they will be giving presentations on researched designers and fashion houses, and finally Professional Development for Fashion which will be taking in their final year – this class will prepare students for interviewing and resume writing." Of course, classes currently offered are incredibly enticing, and they read like poetry to me. Make no mistake: This program is blossoming – like a gawky, stylish teenager finding her fashionable voice, the department has become tailored, streamlined, sophisticated, which is the aim: to prepare the undergraduates to excel, grow, leap and prosper with complete abandon into that sea of stylish sharks. So what are the success stories of Mercyhurst's seasoned style setters? Erika De Salvatore, 2000 graduate, was on "Fashion Star" representing Express. Erika has been a buyer with the company and was one of the panel judges for the show that aired in March. Bridget Helene Bahl was on the "Fashionista Diaries" in 2007, she is a former public relations darling for Yves Saint Laurent and dabbles in hosting on the VFiles. Angie Pascoe, class of 2007, is the Assistant Buyer at DSW, and Monica Porostosky, 2008, is the Senior Assistant Buyer of Fine Jewelry at Saks. Lastly, me. I was a 2007 graduate. With the guidance of Amy and the fashion faculty, I flourished. If you like what you see on shopjujus.com and what you read in Street Fashionista, you have Mercyhurst to thank. It's clear even though Amy says she has nothing to do with it she has most definitely molded, nurtured, tutored, and coached each student to become the best version of themselves. Leslie McAllister can be contacted at LMcAllister@ErieReader.com, and you can follow her on Twitter @ShopJuJu.